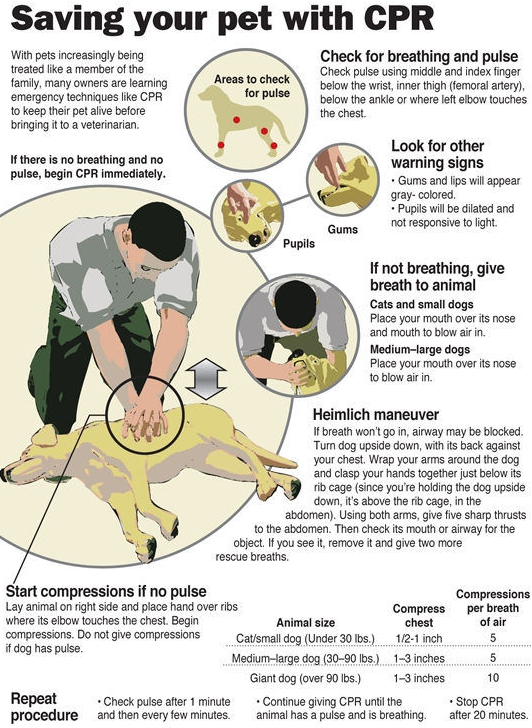 When I first saw this image (courtesy of the American Red Cross) I was shocked to realize that despite the countless hours I have logged learning various first aid and emergency protocol skills (an inevitable side-effect of years as a camp counselor and backpacker) I would have almost no idea what to do should one of my dogs go down in an emergency scenario. This step-by-step Pet CPR [pdf] from the Greenwich Animal Hospital is also worth downloading and having on hand in the event of an emergency– like a good boyscout it’s always better to be prepared. For more information check out ‘First Aid Skills Can Help Save a Life – Your Pet’s’ by Red Cross staff writer Shilpika Das.